In this seventh-grade humanities lesson, students make corn tortillas, beans, roasted squash, and cabbage slaw. They learn about the different agricultural techniques utilized by the Maya, Aztec, and Inca civilizations, including companion-planting corn, beans, and squash. Explain the agricultural techniques used by the Maya, Aztec and Inca civilizations. Understand how the geographic locations, landforms, and climates of Mexico, Central America, and South America affected the food and farming of the Maya, Aztec, and Inca civilizations. Make connections between the diets of historic cultures and foods we eat today. Identify the agricultural techniques used by the Maya, Aztecs, and Incas by name, and use the visual aid to explain the meaning of each term. Explain what can be deduced about the geography and terrain of each civilization based on the agricultural techniques they used. Recognize how foods that originated in the Americas are prepared and eaten in modern times. Collect all the tools and ingredients, and distribute them to the tables. Copy the Cabbage Slaw recipe to hand out. Soak and cook the beans. Welcome students and introduce the recipe for the day: Three Sisters Tacos. Today we’ll also be looking back in time at three of the major civilizations of the Americas—the Maya, Aztec, and Inca. The Maya, Aztec, and Inca civilizations were not the only major ancient American civilizations, but they were three very important, powerful, and influential civilizations of their times. Often when one thinks of power it is easy to think only of brute strength. And each of these civilizations did indeed conquer other civilizations and have armies. But what really allowed them to be so powerful was they were masterful at growing food—they were excellent farmers. In fact, about 70% of the foods we eat today originated in the Americas, many of them first domesticated and cultivated by the Aztec, Inca, or Maya people. Today we’re going to learn about some of the agricultural techniques they used. Ask students if there is anyone who knows about the three sisters. Give students a clue that the three sisters are not people, but three types of foods. The three sisters are beans, corn, and squash. They are called the three sisters because they grow together and support each other. Prompt students to think of the corn they have seen growing in the garden. How does a corn plant look? It is tall. How does a bean plant grow? It grows as a vine. When corn and beans grow together, what do you think happens? The corn supports the bean by giving it a place to climb, and the bean fixes nitrogen in the soil, enriching it for the corn and squash. What does a squash plant look like? It has large leaves and covers a lot of ground. Why would that help the corn and beans? It shades out weeds, keeps nibbling creatures away, and prevents moisture in the soil from evaporating. This is how the three sisters support one another. Companion planting the three sisters was one agricultural technique that people all over the Americas used. Prompt students to reference the poster to identify an agricultural technique that both the Maya and the Inca used: terraces. Ask students to use the poster to define “terrace” and explain the benefits of terracing. Ask students: What does the fact that both the Maya and Inca used terracing to grow food tell you about the places they lived? They lived and farmed on mountainous terrain. Prompt students to reference the poster to identify an agricultural technique that both the Maya and Aztec used: canals. Ask students to use the poster to define “canal” and explain the benefits of building canals. Ask students: What does the fact that both the Maya and Aztec built canals tell you about the places they lived? They were both marshy, so they used canals to drain the places that were too wet, bring water to places that were too dry, and extend the amount of land suitable for agriculture. Ask students to identify the one agricultural technique that appears on the poster that hasn’t yet been discussed: chinampas. Ask students to use the poster to define “chinampas” and describe how chinampas might have been made. Chinampas were made by driving posts into the bottom of the lake and attaching tightly woven nets in between the posts, then filling the underwater enclosures with rocks, sediment, and soil. Tell students that the beds formed on top of the chinampas were so fertile that Aztec farmers could grow up to seven crops per year in a single bed! This means that just a few weeks after planting a seed, a crop would be ready for harvest. Compare this to the two or three crops that grow per year in the ESY garden for perspective. The Aztec capital, Tenochtitlan, was built in the middle of Lake Texcoco. Modern-day Mexico City was built directly on top of the Aztec capital, and ancient chinampas can still be found today around Mexico City. Today as we make our Three Sisters Tacos, reflect on the fact that if it weren’t for the farming expertise of these three civilizations, many of the foods we eat and love today might not exist, including the three sisters. What is your favorite kind of flatbread (tortillas, pancakes, pita, lavash, etc.)? Review the recipes and assign cooking jobs. Prepare the recipes and set the table. Ask students to rate the food using their fingers on a scale of 1 to 5. If there is time, ask students to share ideas of ingredients they might add to their tacos if they were to prepare them at home. Visual Aid: We find that this Chef Meeting is most successful and engages the widest variety of students when we really prompt the students to use the visual aid. 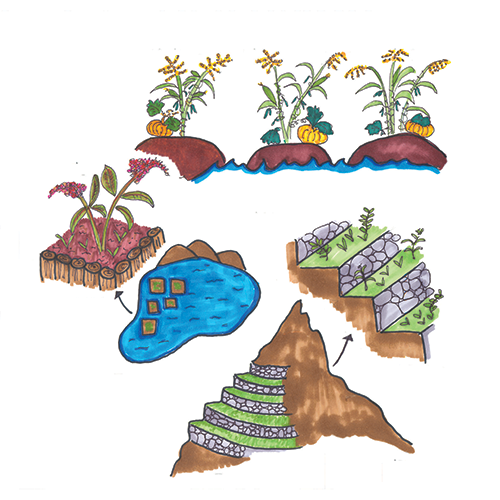 “Floating gardens” – It can be a common misconception that Aztec chinampas were floating. They were in fact human-made islands built up in bodies of water, so they were connected to the lake or river bottom and not just floating on top of the water. Peeling the Squash: Winter squash can be very difficult to peel. Depending on the skill level of the students, we may pre-peel the squash, or we may demonstrate how to use a paring knife to peel. With the paring knife, we emphasize how gently sawing, not just pushing straight down, works the best. Smelling the Squash: Students often really enjoy smelling the winter squash and notice that the odor is similar to watermelon or cucumbers. If you use a variety of squash, this comparison can be really fun. Cutting the Squash: Cutting the winter squash is a good opportunity to show students how to use their body weight to cut tough vegetables. Depending on how hard the specific squash we’re using for a lesson is, sometimes we pre-cut the squash in slices so students need only to dice it. Cutting for Even Cooking: Making roasted squash is a good opportunity for students to practice cutting squash pieces into consistent sizes so that they cook at the same rate. We often tell our students that one trick is to make the initial slices the same width. Seasoning the Squash: When seasoning the squash to roast, we tell our students to use enough oil so that every piece of squash is shiny all over, but there’s no oil pooling at the bottom of the bowl. We encourage them to taste for salt. Scallions vs. Red Onions: Either scallions or red onions may be used in the cabbage slaw. We generally prefer to use scallions because they are easier on the students’ eyes. Salting the Cabbage: Slicing the cabbage as thinly as possible and salting it early yield the most delicious results. Salt helps to draw excess water out of the cabbage, making it softer and allowing it to more fully take on the flavor of the dressing. Cilantro Stems: We like to chop both the stems and the leaves to add to the slaw. We find the stems have a really delicious sweet flavor. “Winter salsa” – Calling the cabbage salad a “slaw” can evoke specific expectations for students (i.e., sweet mayonnaise dressing). We took to likening the cabbage slaw to a “winter salsa,” explaining that if it were summer, we’d be making a salsa with tomatoes (pico de gallo), but because tomatoes weren’t in season we were using cabbage instead. This approach tended to drum up a lot of enthusiasm for the slaw and encouraged a number of students who had previously been skeptical to try it. Bean and Masa Amounts: We used 4 cups of cooked beans and made masa from about 3½ cups of masa harina for each group of 10-12 people (about 4 cups dried beans and 10½ cups masa harina for a class of 30). Seasoning the Beans: Make sure students heat the beans as they season them. The spices will taste different as they warm and as they have time to simmer. Encourage students to taste the spices while the beans are heating before they decide which ones and how much of each spice they want to add. Spicy Ingredients: Both the beans and slaw have the option of going spicy in this lesson. We find this is a good opportunity for groups to practice coming to a consensus about seasoning. We often remind them that you can always add spice but not take it away, and that those in charge of making the beans or slaw have the responsibility of cooking for the whole group. Designating Tortilla Masters: Making the tortillas is often a very popular job. We like to give everyone a chance to make a couple, and find that this is an ideal opportunity to have students who have already made a few teach those who are just starting out. Tortilla Pressing Tips: We use wooden tortilla presses and line each side of the press with a piece of plastic to prevent the masa from sticking to the wood. We always show students how to gently peel the plastic off of the pressed tortillas instead of the other way around to keep the raw tortillas from ripping. Cooking the Tortillas: Patience is key in getting the best product here. Wait for the middle of the tortilla to steam and for the edges to curl up before attempting to flip. Flip too early, and you risk ending up with tortilla scramble. We keep the tortillas wrapped in tea towel after taking them off the griddle, which keeps them warm and moist. Hot Sauces: We always have a variety of hot sauces available. Different students identify with different hot sauces, and we find students are excited to see their culture represented in the space. It can be a great conversation starter to ask students which hot sauce is their favorite, or whether they like to eat different kinds of different foods. Study the locations, landforms, and climates of Mexico, Central America, and South America and their effects on Mayan, Aztec, and Incan economies, trade, and development on urban societies. Describe the Meso-American achievements in astronomy and mathematics, including the development of the calendar and the Meso-American knowledge of seasonal changes to the civilizations’ agricultural systems. Select correct knives from the Edible Schoolyard Toolbox. Refine knife skills by using different cuts and sizes while demonstrating knife safety and care. All lessons at the Edible Schoolyard Berkeley are a collaboration between the teachers and staff of the Edible Schoolyard and Martin Luther King, Jr. Middle School.